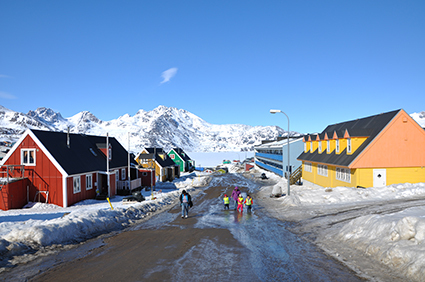 East Greenland. Next Information. Stand-by. Delayed. Cancelled. These are words you need to get used to, when traveling in East Greenland. It is more likely, that things do not work out instead of them working out, at the time you want them to. Plans are made to change them. Plans are better not made at all. Here you are thrown back onto yourself, over and over again. You want, but what you want, simply does not happen. Make something out of this, out of the Not-Happening, the Waiting, with the everything over shining Non-Availability, with the everlasting presence of absence of almost everything you are used to. This is, how it is, here, but I do not allow myself to whine, to get angry, to be inpatient and outrageous. I am only a guest here, as are others. Somewhen we will be back in our organized, structured, regulated world, in which everything is always easily available. Including ourselves. But this is valid only for us who come and go, and not for the people, who stay. The people here do not deal with the end of a holiday, the end of a work, a travel home. For them it is a visit to a doctor, the arrival of food, of goods. For them all these insecurities do really matter. It is their daily life. I am in East Greenland since almost one month. On the way here I was stuck in Iceland for five days. While I was here, there was for one and a half week no helicopter. One and a half weeks for one repair – because nobody thinks, that the only connection to the people here is important enough, to create a smarter repair and backup system. It is interesting, what all this does to people who wait. The people from the South. Surprisingly, most of them talk about helicopter, Kulusuk, Air Iceland, Reykjavik and wind. One and a half weeks, every morning until every evening. Only few accept the waiting and look for something to do. Some start falling apart, every day a little bit more. The waiting makes them furious, and the feeling to be stuck. No control. That is what you need to learn, you do not have control, not about the weather and about anything else. Everything here is, as it is, and how it is you will see from one moment to another, and not before, and even then it is not entirely sure. Everything is negotiable, always again. The people waiting, from here, do not care too much. One is inpatient, he is waiting for a telephone. But he knows. Somewhen it will come, it is like it is. Who has no patience – like me – learns here every day. Things do not go as you want and as you are used to. They work somehow different, but it is hard to understand how – for a german head. The last supply ship was here before the winter, now it is April, and the next will be here in June. While the days get longer, the shop gets emptier, on item after the other disappears, and the only thing that seems to be always on stock, are Chips. Here is no amazon, no over-night-delivery. Sometimes there are not even screws to screw a shelf to the wall. That is how it is, the shelf has to wait, and so do the things that were supposed to go on it, and also yourself. East Greenland, that is Greenland from behind, and indeed, this is how it is called: Tunu. There is a hidden treasure in this backside. When things go different than you planned, you learn. Your road is simply taking a different turn, and all of a sudden there is no This-is-how-it-has-to-be anymore, and in the very moment you understand this, you feel free. What a system we have created, in the South! Always tighter around ourselves, everything always fix. Train delays of five minutes are announced, as nobody ever has five minutes. Time is money. Nothing is fix here, everything is free. Ten minutes, and you are out of town, in the wild world of East Greenland, in the vastness and the silence, in a fantastic world made of snow and ice and water. You are stuck here but free, you can rage against this remoteness and the daily negotiability, and then you can calm down again. And somewhen you realize, that this whole package in itself is above all: wonderful.